My contribution to the above result was a flag for the “Searchme” task authored by Eat, Sleep, Pwn, Repeat. 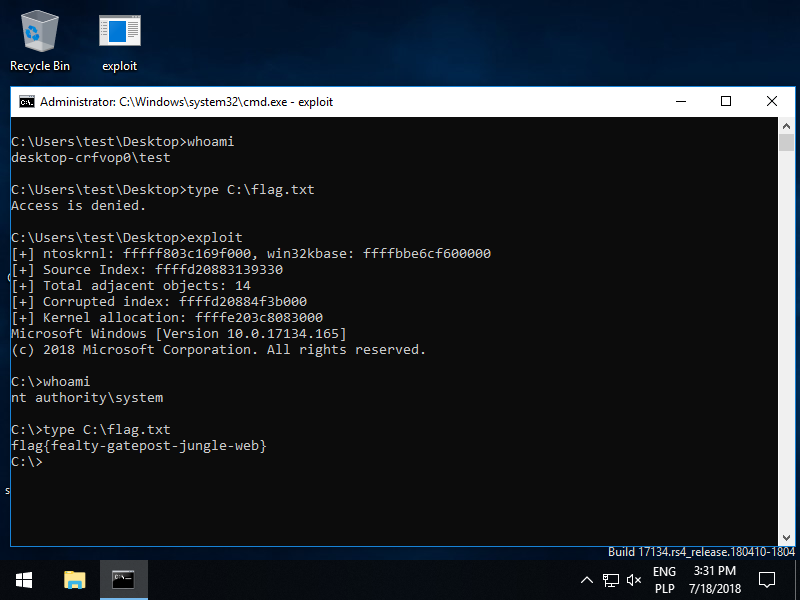 It involved the exploitation of an off-by-one buffer overflow of a PagedPool allocation made by a vulnerable kernel driver loaded in Windows 10 64-bit. Shortly after the CTF, the original author (@_niklasb) published the source code of the driver and the corresponding exploit (see niklasb/elgoog on GitHub and discussion on Twitter), which revealed that my solution was partially unintended. Niklas used the off-by-one to corrupt allocation metadata and performed some pool feng-shui to get overlapping pool chunks. On the other hand, I achieved a similar outcome through a data-only attack without touching any pool metadata, which made the overall exploitation process somewhat simpler. I encourage you to closely analyze Niklas’ exploit, and if you’re interested in my approach, follow along. If you want to jump straight to the exploit code, find it on GitHub. 0x22200C – transforms an existing object of type-0 to type-1 in a one-way, irreversible manner. In the handling of 0x222008, the driver wouldn’t allow duplicates within the list of integers associated with a string token. However, it only checked the newly added value against the one at the back of the list. For example, a [1,2,2] list wouldn’t be allowed due to the equal consecutive numbers, but [2,1,2] could be created just fine. This seemed especially odd considering that the list was sorted later on when being processed by another IOCTL, potentially nullifying the whole point of the duplicate detection. Assuming that buf_end was the smallest address beyond the valid buffer, this could indicate an off-by-one error, as the comparison should otherwise use the >= operator. Since following the leads discussed above could be time consuming, I decided to try an easier route and see if I could trigger any crashes through dumb fuzzing. This would allow me to start my analysis from a known bad state, instead of spending time on searching for memory corruption primitives in the first place. In the context of fuzzing, it was convenient that the communication interface of the driver was limited to four simple operations. During the development stage, I created several wrapper functions around DeviceIoControl which were later reused in the actual exploit. The fuzzer was very simple in its core – it infinitely invoked one of the IOCTLs with random, but correctly formatted input arguments (token=["aa","bb"], value=[0..9]). Arg3: fffff8026b482628, if non-zero, the address which referenced memory. fffff802`6b482628 0fbe00          movsx   eax,byte ptr [rax] ds:ffffd900`9c68b000=?? The crash occurred at searchme+0x2628, which belongs to a bit-writing function – the same that contains the suspicious *cur_buf > buf_end comparison. Further analysis and experiments (e.g. fuzzing without Special Pool) confirmed that the overflow was indeed limited to a single byte. At that moment, a light bulb went off in my head – I had already seen similar code not so long ago! After a quick check, it turned out to be true; the “searchme” task was in fact a slightly modified and recompiled version of elgoog2 from 34C3 a few months ago. The immediate benefit of the discovery was that the “elgoog” task came with debugging symbols, including structure definitions, function names and so on. After doing a bit more recon, I found this tweet, which lead to this short write-up and an exploit from shiki7 from Tea Deliverers. The unintended type confusion bug was patched in “searchme” so the old exploit no longer worked, but it still provided some valuable insight. Additionally, Niklas’ description of the pool buffer overflow in point (1) reinforced my belief that this was the intended bug to be exploited here. And so, I spent the next hour or two moving the symbols from “elgoog” to my “searchme” IDA database. Upon looking into the series of commands sent by the fuzzer to trigger the crash, I learned that the overflow was indeed caused by “compressing” (IOCTL 0x22200C) an object containing a token with duplicate entries. Since I could only write one byte beyond the allocated buffer, it was likely that its value would need to be carefully controlled. Even with the help of debug symbols, I was still unsure what data structure was constructed by the code, and hence – how to precisely control its contents. // Fill input_buffer with random numbers and sort it. With the ability to choose the single byte overflowing our allocation, it was time to lift the primitive to a more powerful one. Most dynamic allocators used today place metadata in front of the allocated memory chunks, which has historically facilitated a number of generic heap exploitation techniques. On the other hand, it may currently make the exploitation of small overflows difficult, as metadata separates application-specific objects from each other, and it is often subject to extensive integrity checks. It is obligatory to make the following two references here: A Heap of Trouble: Breaking the Linux Kernel SLOB Allocator (Dan Rosenberg, 2012) and The poisoned NUL byte, 2014 edition (Chris Evans and Tavis Ormandy, 2014). In his intended solution, Niklas also used pool metadata corruption to confuse the kernel pool allocator, and consequently have two distinct objects overlap with each other to achieve a more useful primitive. This is a valid approach, but it requires the exploit writer to be conscious of the inner workings of the allocator, and to precisely set up the pool layout to guarantee reliable exploitation. As a personal preference, I find it easier to attack program-specific objects than internal system structures, so I intuitively started looking for options to solve the challenge this way. Metadata is stored separately, so allocations start at page-aligned addresses such as 0xffffa803f5892000. The chunks are often adjacent in memory; e.g. two consecutive allocations of size 0x1000 may be mapped to addresses 0xffffa803f5892000 and 0xffffa803f5893000, respectively. Thanks to the fact that the type of the object is either 0x00000000 or 0x00000001, our one-byte overflow enables us to change the type of the object from compressed_index to inverted_index. The type confusion has some handy primitives – in the structures above, we can see that the table pointer at offset 8 overlaps with the items of offsets and offsets. The values in the offsets array are offsets of compressed data relative to the compressed index, and thus they are relatively small. In our testing, they were equal to 0x558 and 0x56C, respectively. When combined and interpreted as a 64-bit address, these two values form the following pointer: 0x0000056c00000558. 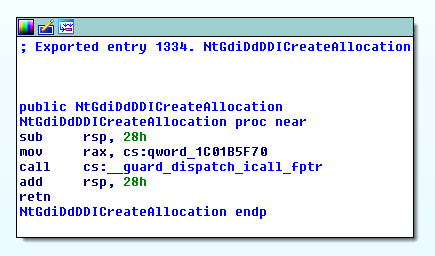 It is not a typical address often observed in regular applications, but nevertheless it is a canonical user-mode address that can be mapped by the program using a simple VirtualAlloc call. In other words, the type confusion allows us to redirect a sensitive kernel-mode pointer to user space, and get complete control over the _ii_token_table structure used by the driver. fffff800`8b981fea 48f77108        div     rax,qword ptr [rcx+8] ds:002b:0000056c`00000560=???????????????? Let’s take a closer look at the capabilities provided by the controlled _ii_token_table structure. fffff803`8ccc1905 3954881c        cmp     dword ptr [rax+rcx*4+1Ch],edx ds:002b:41414141`4141413c=???????? The above crash log doesn’t fully illustrate the “write” operation due to some prior meaningless reads from PostingList.data, but the attack works. At this point, I could write arbitrary kernel memory but not read it, which ruled out the option of data-only attacks performed directly from user-mode. However, with the write-what-where primitive in hand, executing ring-0 shellcode should be just a formality. In this case, it was made even easier thanks to the fact that the exploit was running at Medium integrity, so it had access to the base addresses of kernel modules, and could acquire other useful addresses through the various information classes of NtQuerySystemInformation. Overwrite the function pointer with the address of nt!ExAllocatePoolWithTag. Call the routine with the NonPagedPool parameter to allocate writable/executable memory. Write the ring-0 shellcode to the allocated memory. Overwrite the function pointer with the address of the shellcode. The above scheme makes it possible to cleanly execute the desired payload without corrupting the system state (except for the one overwritten pointer). In his paper, Morten suggested the use of NtGdiDdDDICreateAllocation as the proxy syscall, but I found that it was used in Windows sufficiently often that the system would start malfunctioning if the pointer was not promptly fixed up. To make my life a little bit easier, I chose a less frequently used service that seemed to be called exclusively by my exploit: NtGdiDdDDIGetContextSchedulingPriority. As a reminder, the full source code of the exploit is available on GitHub. Thanks for the nice exploit. 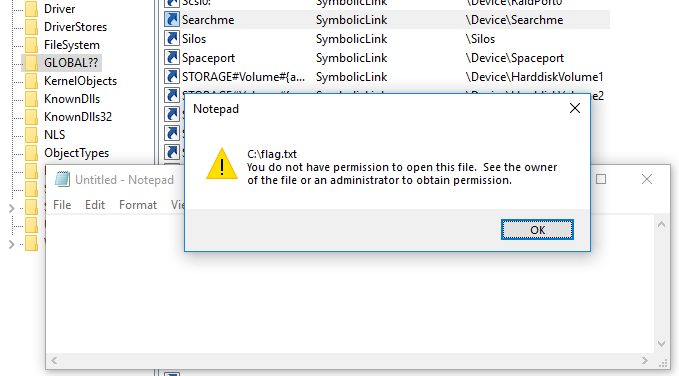 [-] Unable to open handle to vulnerable driver. @Morre because you don’t have the vulnerable searchme.sys.